Em que você ande pelo sítio de patinete// Of you skating around the farm! The beloved tale of Pedrinho and the Saci he captured – by Monteiro Lobato. Halloween keeps getting bigger in Brazil. 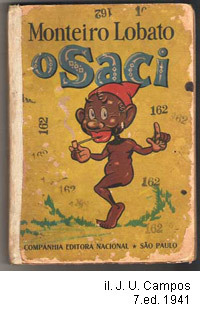 But since 2003, October 31 has officially been “Dia do Saci,” in honor of the little one-legged rascal from Brazilian folklore. Saci is never without his magic red sock hat and pipe; he lost his leg playing capoeira, and can’t stop getting into mischief. Legend has it that he lives in whirlwinds and can be caught with a net; upon capture, his hat must be removed to ensure his obedience! Sacis are rumored to be born in bamboo shoots, where they live for seven years before emerging to wreak playful havoc for the next seventy-seven years. When they die, they turn into mushrooms. In 1982, Jorge Ben wrote and recorded the song “Sasaci Pererê” for the TV special Pirlimpimpim, named after “pirlimpim powder,” a kind of fairy dust that Monteiro Lobato included in his stories. Monteiro Lobato was perhaps Brazil’s most beloved children’s writer, and in 1982 Brazil celebrated his centenary. 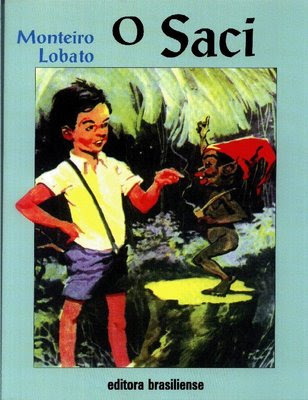 One of Monteiro Lobato’s most treasured stories is about a little boy, Pedrinho, who managed to capture a Saci. Saci Day was declared in Brazil’s Federal Law 2.762, in 2003, part of a bill presented by Rio de Janeiro’s deputy Chico Alencar (PSOL) in an effort to celebrate Brazilian folklore rather than traditions imported from abroad – in this case, the celtic celebration of Halloween, imported from the United States.